Stonehill student Candace Crocker ’16, psychology major, was one of eight students in New England to be named Honorary Undergraduate Scholars for excelling in her studies. 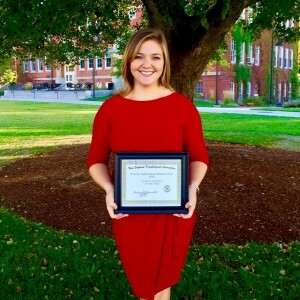 While most receive this award as graduate students, Candace is remarkably one of two current undergraduate students to receive it at the New England Psychological Association’s (NEPA) 55th annual meeting hosted by Fitchburg State University in October. NEPA presents the award to students who achieve a very high cumulative GPA, have done research, done service work, attended psychological conferences, done creative writing and contributed to their schools through admissions, residence life, tutoring and even fundraising. In addition to these requirements, the students must have demonstrated a clear and serious interest in psychology. Associate Professor of Psychology Christopher Poirier and Assistant Professor of Psychology Nicole Capezza, said they nominated Candace based on her performance as one of the top-ranking students in class. Her outstanding achievement in the classroom prompted Poirier to invite her to join him and Capezza in their latest research project, the American Psychological Association Registered Replication Report initiative. The research will be published in the professional periodical Perspectives, where Candace will be listed as co-author. At Stonehill, students have the opportunity to collaborate with professors and gain real world experience through programs such as the Stonehill Undergraduate Research Experience (SURE). This type of experiential learning helps students narrow down their field of study and increase their knowledge in a specific area.